– The Bubble Dreamer on the eponymous hero’s lack of reasonable means to keep his hands and feet in place. Platformers of old had some character about them: even through the pixellated lens of the eight and sixteen bit eras, there was a level of simplicity about them that could be described as nothing nothing other than “charm.” The harsh yet concordant tones of the NES Mario games; the simplicity of Crash Bandicoot‘s “collect everything and be rewarded” ethic: platformers of the eighties and nineties represent everything good about games – simplicity and good design. Games with intellectual property developed after this era in the genre tend to be somewhat marked in the difference in priorities evident in their production, and suffer for it. Take Naughty Dog‘s Uncharted series: for what is essentially a platformer with combat sequences, the platform sections’ ends are so excruciatingly obviously signposted in some points hideously obliquely disguised in others – an unfortunate consequence of attempted increases in graphical fidelity. Rayman Origins takes the approach of simple, colourful 2D graphics in wonderful 1080p HD and it is glorious. Look, just look. And it looks this good in motion. 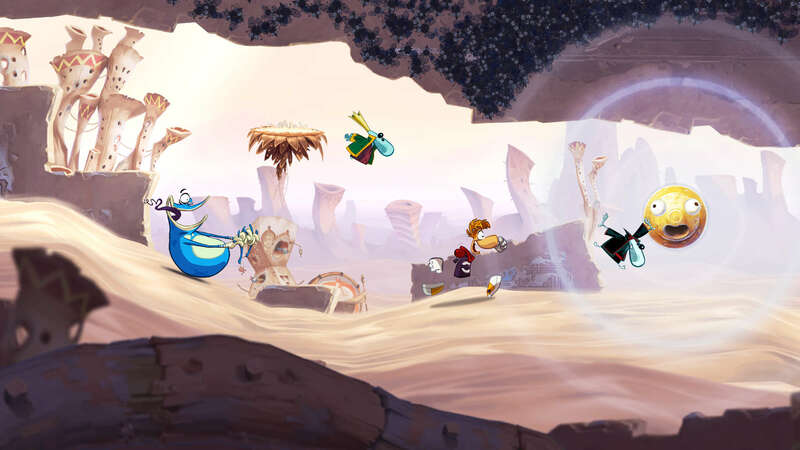 Much as it is frowned up to gush over graphics, especially in an era where it is the default to be in awe of how wonderful graphics are now if one had a PlayStation as a child, Rayman Origins is beautiful.Over the course of the game, the player is taken through a series of vastly different locales, each with its own visual identity disparate from the others. Polar scenes are contrasted with stylised kitchens and bizzare dreamy interpretations of the depths of the sea. All, as previously mentioned, in high definition, and with not a slightest hint of any slowdown: the game runs smoothly no matter what is on the screen, and it can get incredibly busy in some levels. Naysayers may be quick to say that such a technical feat is a great deal easier to undertake when the elements of your game are down a dimension on its contemporaries, but their claims should be taken with a pinch of salt: yes, there is an innate loss of workload when one is only dealing with two dimensions rather than three, but the incredible attention to detail, from character, enemy, world and boss designs, within the game and its incredible knack for providing as close to a bullet-hell experience as a platformer is likely to provide and still function well in the later levels still point to the smooth running of the game taking some serious work on the part of the developers, Ubisoft Mountpellier. Once one has come to terms with the luscious appeal of the fantastic cartoonish graphical work, the gameplay does not disappoint. Across the sixty or so levels of the game, we are presented with several different styles of gameplay, each of which are incredibly competent in what they seek to provide to the overall game experience. The core of the game rests in recovering the Electoons in order that the Bubble Dreamer can regain his sanity, following the attack on Rayman and friends that frames the action at the beginning of the game. To this end, the majority of levels consist of seeking out Electoons locked in cages and the destruction of the cages in order to free them. A second gameplay element emerges from the availability of an in-game collectable: the Lums. The collection of a sufficient number within each level will allow for the exchange of them into another Electoon. The collection of Lums is not simply that: the collection of Lum Kings increase the value of each other Lum collected by one for a short period of time: this is a platformer not only about collecting what is in the level blindly, but one about collecting in the right way to maximise the collection. Curiosity and tenacity are also rewarded through the presence of ‘skullcoins’ worth 25 Lums in either dangerous or hidden areas of levels. The addition of local cooperative play in a platformer was an inspired one. The various types of collectables on offer are not, however, the core of the variation in the gameplay. Rayman Origins is not the first platformer to incorporate gameplay mechanics from other genres, but is one of few to execute them well. 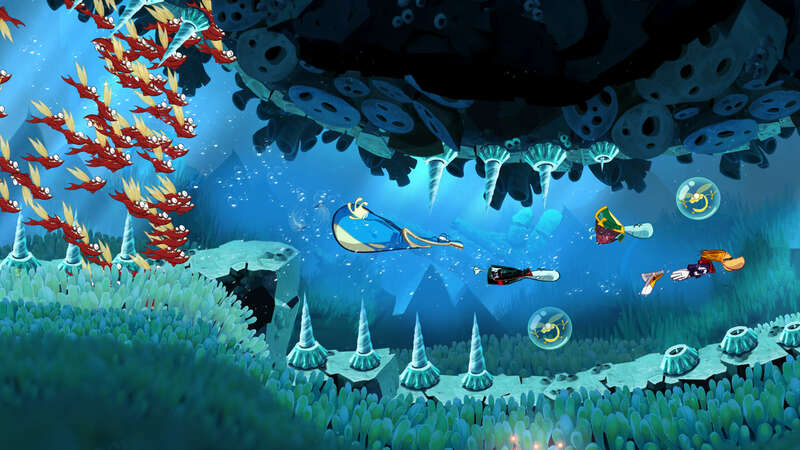 Aside from the usual right-to-left-jumping of the platformer, Rayman Origins also provides side-scrolling shooter sections, time trials on every level once they’ve been completed once (with adequate times resulting, once again, in the award of an Electoon), chase sections and underwater swimming sections. The list of gameplay types on offer here does show more than a slight resemblance to those on offer in 1998’s Crash Bandicoot 3: Warped, but that is not necessarily a bad thing. That was a game both of balance and challenge, both of which are reflected in Rayman Origins. While getting used to one of the gameplay styles after a while away from it can take a while, this process of learning and recollection is something that keeps all of the game’s mechanics fresh and prevents an odious feeling of déjà vu. The crowning glory, however, ofRayman Origins is something that tends to be forgotten in an age of always-on high speed Internet access: people like to play games together, when in the same room. Great though online multiplayer is, it lacks the fun and immediate sense of true cooperation that can be had when sitting in the same room as someone, sharing space and a screen. ThoughRayman Origins’simplementation of the cooperative element may lead to (pointless) squabbling over who should collect Lums, the core mechanics are there: the game genuinely plays differently, especially in the context of the boss fights, when it is played cooperatively. There are issues at times with some of the more time-sensitive levels, such as chases, and space for two or more players to move about in, but this is rare enough that it does not get in the way of enjoying the game. Those spikes have claimed many a Rayman. Going back to what was said earlier about the “good old days” of platform gaming, Rayman Origins also brings back something that has been missed in certain sectors of the gaming industry. The game does not take itself too seriously: it is innocent, and just concerned with providing a good experience for the player. Exposition within the game is kept to a minimum, with only a short introduction and ending providing any real meat to the “story” of the game. Any other details about the world are included within the game’s manual, which, at twenty pages for the EU edition, is long for a modern manual. The fact that it even includes a section for the making of notes points further to it being a game concentrating on being a game, rather than a visual novel. In this genre, that is simply the best way to go about things. The game is innocent to such an extreme extent that the borderline phallic imagery in some parts of the game (certain enemy designs and the end-of-level awards screen) can only be seen as a slip and not as some joke perpetrated by the developers. 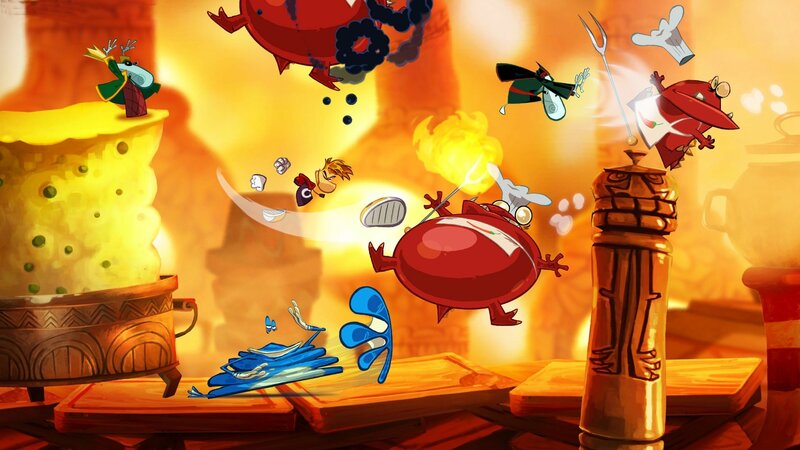 Rayman Origins is a breath of fresh air in platforming. GAME OVER SCREEN ANALYSIS: Rayman, as it turns out, is incredibly resilient. There is no system of keeping lives in this game, so there is no true game over screen. The death animation of Rayman turning into a bubble, however, is amusing – until the final few levels, where the player will see it a lot. After several subsequent deaths in one area, the player will be made aware that this area is particularly difficult, and is given the option to “stay” or “leave.” Leaving will just mean that you have to play that level up until that point again, it turns out. The accompanying “yikes!” with that message must have been some sick injury to add to the experience from the developers.